This is what the uniforms will look like when the Bisons become the Buffalo Wings for a June series against Rochester. 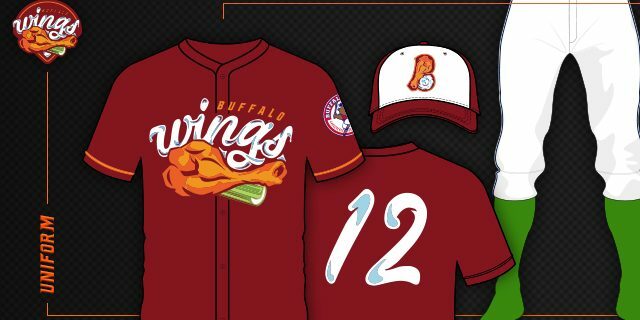 The Buffalo Bisons announced that for a June series with Rochester, the team will play as the “Buffalo Wings” while the Red Wings will become the “Rochester Plates.” Honoring the two cities signature foods has created a buzz and a boost in souvenir sales. But as sports humorist Jeff Wozer has found out, there will be other changes for the series at Coca-Cola Field. • First 500 fans receive a quart of generic blue cheese dressing. • Players will wear jerseys made from recycled Bev Naps. • Official team name: Duffalo Wings. • In the event of a rain delay the infield will be covered with aluminum foil. • Chick-fil-A’s eat-more-chicken cow will throw out the first pitch. • Seventh inning stretch replaced with seventh inning floss. • Celebrity chef Rachael Ray will serve as the team’s third base coach. • Before the game, in centerfield, Wing King Drew Cerza will box Charlie the Butcher. • Fans will be asked to choose a food name for the Buffalo Bills to use in the upcoming season, picking between the Condiment Filled Paula’s Donuts or the Beer Battered Sponge Candies. • Game will be aired live on Yelp.com. Jeff is always on top of all developments when it comes to the Bisons and food. Here’s what he found out about how Celery is struggling with retirement.